The Super Bowl is annually one of the most anticipated events of the year, drawing in millions of fans from all over the world to watch the top team from each Conference compete for everlasting glory. With the Super Bowl quickly approaching, now is a good time to dive into some statistics and analytics from previous Super Bowls and Super Bowl winners. While the old adage “Defense wins champions” may ring true to most, the average score of the Super Bowl is 30.14 to 15.82 (or 30-16 with some small rounding). 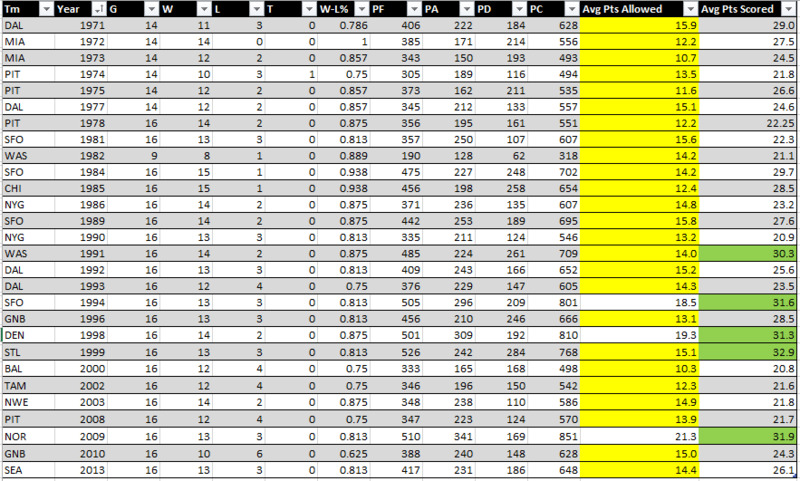 Since 1970, a team has allowed 16 points or fewer in a season 157 times. While that number may seem high, it only represents a total of 11.2% of all teams or that period of team. Of the 45 Super Bowl winners since the merger, 25 teams have allowed 16 points or fewer during the regular season. In comparison since 1970, only 31 teams have averaged 30 points or more per game in the regular season, which represents only 2.2% of all teams in the league since 1970. Only five teams that have averaged more than 30 points per game in the regular season have gone on to win the Super Bowl. Only two teams in NFL history have averaged more 30 points scored and allowed less than 16 points against – the 1991 Washington Redskins and the 1999 St. Louis Rams. 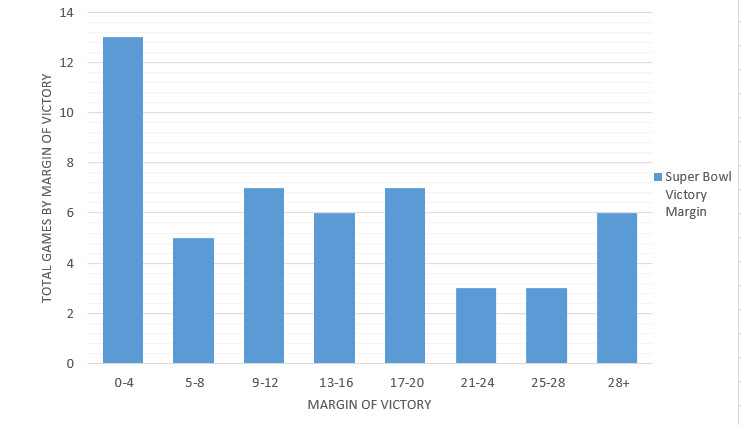 Though the average score of the Super Bowl is 30-16, there are is a wide array of different outcomes and victory margins. The chart below shows just how diverse the margin of victory over the first 50 Super Bowl has been. The group are games decided by 4 points or less. This group makes up 13 games or 26% of all Super Bowl. Outside of this group, no other margin of victory is more than 14% of total Super Bowls (both 9-12 points and 17-20 points have been the margin in seven games). The idea of that two top teams meeting on a neutral field would produce a close game is somewhat nullified by the fact 38% of Super Bowls have been decided by three scores (17 points) or more. The biggest spread in Super Bowl history was -18 for the San Francisco 49ers over the San Diego Chargers – which the 49ers covered in a 49-26 victory. The New York Jets were 17-point underdogs in 1969 and the New York Giants were 14-point underdogs in 2007. Not only did both teams cover, but also both teams won the game. Since the merger in 1970, 113 total players have thrown a pass in a Super Bowl game. Of the 113, 91 players have attempted 10 or more passes. The average statistical line for a passer with at least 10 attempts is 17.2 of 28.9 for 212.6 yards, 1.4 touchdowns and 1.1 interceptions. Of the 91 players, 38 have thrown for two or more touchdowns, 32 threw a single touchdown and 21 did not throw a touchdown. Since 1999 when Kurt Warner set the Super Bowl yardage record with 414, the average line for a quarterback has increased to 22.9 for 37.2 for 262.9 yards, 1.6 touchdowns and 1.1 interceptions. A quarterback has thrown for more than 300 yards 20 times in Super Bowl history. Terry Bradshaw was the first QB in Super Bowl history to throw 300 yards. Only Kurt warner has thrown over 400 yards in the game. He currently holds the top three yardage games in Super Bowl history (414, 377, and 365). This information can be useful for prop betting, which is a large part of the Super Bowl.